What is the design mindset? How can the design mindset be built and sustained in an organization? As organizations grapple with a rapidly changing and disrupted world, designers are playing an increasingly important role in solving their most wicked problems. Yet the environments of established organizations are often not conducive to developing and sustaining design practices. How can we manage these challenges in order to help organizations adopt a design mindset and allow it to flourish? 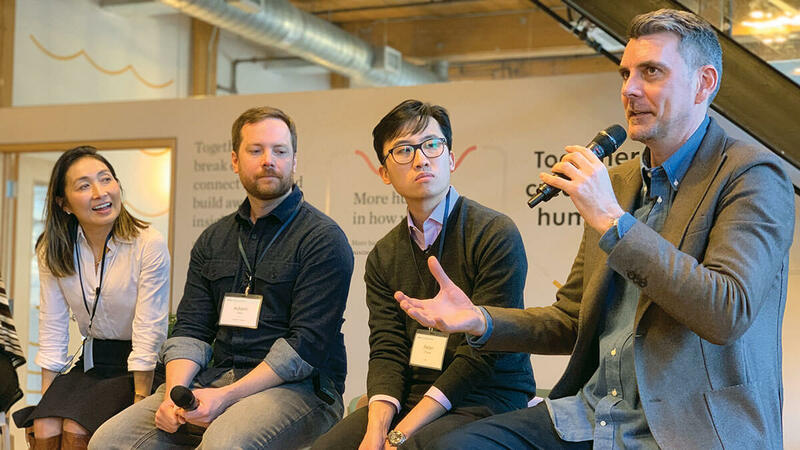 Earlier this month, Bridgeable hosted The Design Mindset, an interactive panel discussion moderated by David Dunne, to discuss this question and more. 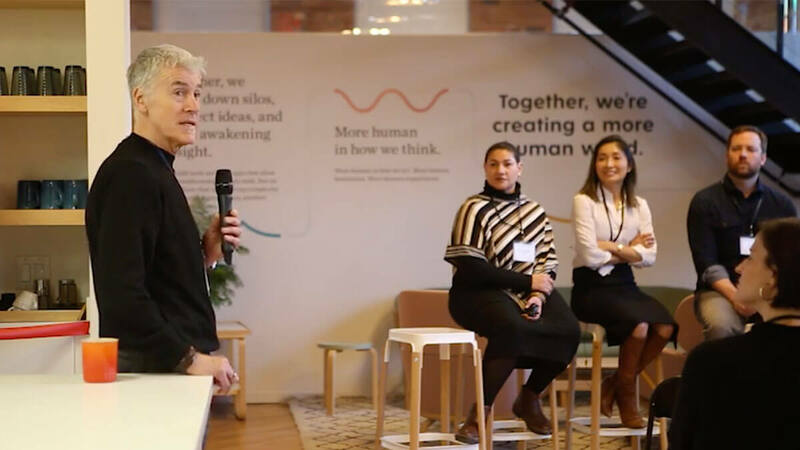 An expert in how designers apply user research, creative thinking methods, and strategy to solve complex, ambiguous problems, David was joined by a “dream team” of design thinkers to discuss how to navigate the challenges inherent to implementing service design. Panelists included Peter Chow, Director, Group Risk Management, Enterprise Risk Innovation, RBC; Adam Fair, Vice President, Strategy and Impact, Prosper Canada; Chris Ferguson, Founder, Bridgeable; Judy Mellett, Director, Service Design and Innovation, TELUS; and Shannah Segal, Senior Manager, Experience Design, Ontario Digital Service. What tensions are inherent to implementing service design? Every design thinker must productively negotiate three tensions in order to deliver great work. David kicked off the session by discussing the three tensions that every design thinker must grapple with in order to produce great results. These tensions, which emerged over the course of over thirty interviews David conducted with design thinkers, are the focus his recent book Design Thinking at Work: How Innovative Organizations Are Embracing Design (2018), which looks at the real-life experiences of design thinkers working with or in organizations. The tension of inclusion: Are you embedded in the organization, or are you standing outside the organization? If you’re embedded, David pointed out, you risk never being able to do anything original. If you’re not embedded, you risk becoming isolated and not being taken seriously. Design thinkers are always straddling these internal and external pros and cons. The tension of disruption: Are you aiming for disruptive or incremental innovation? Many design labs David spoke to are set up with a view to disruptive innovation. Yet they often begin by going after the low-hanging fruit of incremental change, where they can show results quickly and easily by bringing in the user perspective—an approach that tends to blow people’s minds. The problem is, if they’re successful, they’re offered more and more work of this kind. In the long run, they have difficulty finding time to do the disruptive work they planned for all along—the transformational projects that require concentrated effort over time. The tension of perspective: How can you focus on the user perspective while taking into account the system perspective at the same time? David noted that this tension is especially noticeable in public sector and healthcare work. For example, there are many initiatives around improving the patient experience in healthcare, but it’s important to address the healthcare system as well, and this can be challenging. While these three tensions are always present, David noted, skilled design thinkers have found ways to productively negotiate them, enabling their practices to thrive. What have you learned about shifting organizations to a more human-centric, design-driven way of working? Elegant solutions are meaningless without adoption. Chris: It doesn’t matter how elegant your solution is—how great your research or design is—if, through that process, you don’t change the mindsets of people within the company. Too often, people return or reset to old ways of doing things, especially in financial services, healthcare, and other more conservative organizations. Design thinking can transform the most unlikely environments. Peter: At RBC, I lead an innovation lab within Risk Management—and my problem is that I lead an innovation lab within Risk Management! Of all the places you might decide to start with design thinking, risk management is probably not the best. But we’re chasing after big impact, and it’s exciting, because if you can make it work in Risk Management, you can make it work anywhere. We’ve been the poster child not just for change within our group, but also for change within the bank. We have a slogan: “If Risk did it …”! If we can make it work, leadership will have no choice but to say that something is happening. Even when the design mindset is in your DNA, building design capabilities can be challenging. At the systems level: How might we change policies and regulations to help people move ahead? At the service level: What are the programs and services people need in every community across the country? At the organizational level: How can we and our partners be best equipped, and what capabilities do we need, in order to drive this vision moving forward? At the individual level, with the people we’re trying to serve: How can we be collaborators with low-income Canadians so they can see new possibilities and improve their lives? So design is really in our DNA. Building capabilities around service design has been more challenging for us. To scale innovation to the larger organization, build design capabilities internally. 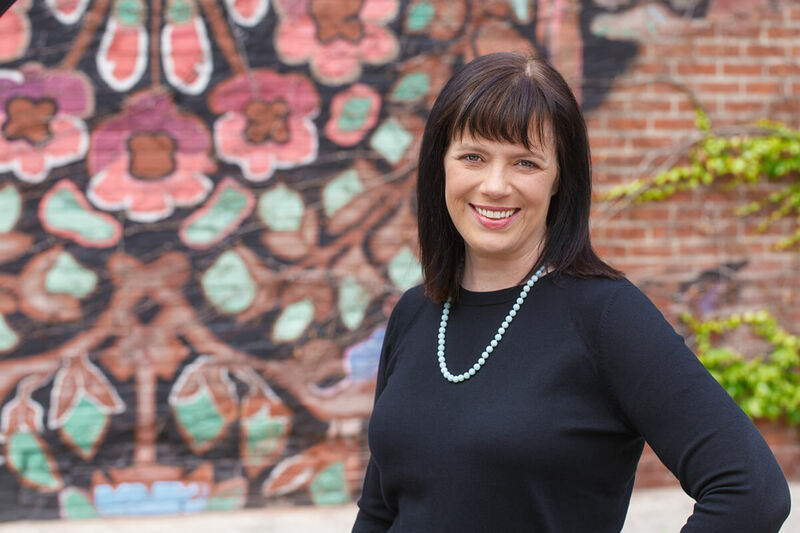 Judy: I head up the service design team within the consumer products division at TELUS. We’re anchored in product development, but we work across the business, including HR and retail. We’ve had good successes over the last six years, operating as a team, and we have lots of great stories. One challenge for us is trying to figure out how to scale pockets of innovation up to the larger organization—teaching more people and letting them do it themselves, with new capabilities, rather than having them rely on the design team. When “design” isn’t in your organization’s lexicon, adopt a beginner’s design mindset. Shannah: I work for the Ontario Digital Service, which is part of the provincial government and was incubated as a lab as part of our Cabinet Office. The tensions you mention, David, are at play in everyday life in the public sector, from short meetings to large-scale initiatives across an organization of 65,000 people for whom design is not even in the lexicon. The word “design” has very little meaning or currency in many of the scenarios I find myself in. So we’re going back to a beginning stage in many cases. The practice, the vocabulary, is completely new. That plays out in many ways, all the way from “How do we make programs better for citizens of Ontario?” right down to “How do we hire the right skillset when there are no supports, no internal vehicles, for nurturing that type of talent?” It’s all new. I recently sat on an internal hiring panel for a job titled Senior Service Designer. There are going to be three—in an organization of 65,000! Some of the work we are doing to bring this culture and this methodology into the organization is just tactical. The tension of perspective can be your business model. Adam: The tension of perspective—focusing on the user perspective while considering the larger system perspective—is actually our business model. We work on the ground with consumers, with individuals who are struggling. We document those issues. This shows us where the system and industry are failing. We use this to leverage and have conversations with the system, to demonstrate that these policies aren’t working for people. We work together to figure out how to change things at a structural level. We try to be that connective tissue between what’s happening on the ground and the system and the policy players so that financial services can work for everybody. Proving your worth initially can produce accelerating returns. Judy: We once worked with a highly competent person in the organization who had a big, challenging mandate and was told to work with the service design team. For him, this meant managing another variable, and he didn’t have time. We had to empathize with him and respect his time. But eventually he got more into it. He started to take over the interviews. The process led to a big insight for him and changes in his plans to go to market. He later became our biggest advocate. Numerous projects have since come to us from his advocacy. And it all began with us trying to understand his perspective. What is the design mindset? How can the design mindset be cultivated and sustained in organizations? The design mindset is about an ongoing relationship in which value is created for the end user. Chris: The old model—the industrial model—is that companies create value within their own walls and then market it. They become efficient at producing something and shipping it to customers. The design mindset is less about efficiency, scale, and predictability—which is a lot of what you’re taught in management school, when you study business—and more about how you can create value on an ongoing basis. How can you create a dynamic, ongoing relationship in which value is being created or co-designed for users? It’s about a two-way exchange with the end user. And it requires completely different skills and ways of thinking. The design mindset is a shift away from old hierarchies. Shannah: For me the design mindset is also about working differently. We talk a lot about trying to get away from the very hierarchical briefing- and approvals-based structure that most of our government functions under and toward something that is more fluid, more dynamic, and more autonomous. That plays into a design mindset in our organization. The design mindset is about inclusivity and empathizing with stakeholder needs. Judy: Our work has also become more about more intentional planning and inclusion. We’ve noticed that innovation is sometimes seen as something that is or can be owned by some but not others in the organization. We ask: Who is excluded from the dialogue? Our work is about inclusion, not just about delivering the project. It’s positioned around how we can help. I remember early conversations with Bridgeable, when we initially started working with them. They said they weren’t looking to be center stage; they were there to help us achieve our goals. We adopt that same attitude as we go into our projects, helping people to achieve their goals and be successful. It’s not about being in the limelight ourselves as a design team. We tell people we’ll try to equip them with everything they need to rally support, get their products out there, get their metrics. It’s about empathizing with the needs of our clients and including more stakeholders in the dialogue. The design mindset is a way to figure out how to do the right things—even when you already know how to do things right. Peter: We are the world’s experts in getting things done right, but we are the world’s worst at figuring out what the right thing to do is. The design mindset is, to me, is this: We’re really good at doing things right, but are we doing the right things? We also understand that it may not work in the first go. And we’ve got that feedback loop that helps us understand how to make it better. Learn from mistakes, from failures. It’s an iterative process, not a linear one. Is the design mindset threatening? 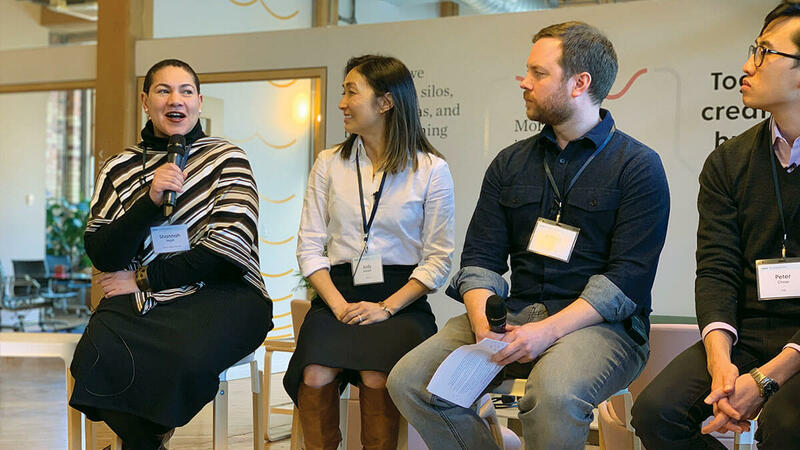 Judy: We try hard not to wear the label of “innovation.” We talk about our work as a design approach—a problem-solving process that can bring the user perspective in to equip people with insights they might not otherwise have. We make it clear that we’ll work together. And we tell people we’re process experts, not product experts. That tends to bring the initial tension down if it’s a group we’ve never worked with before. Sometimes. But you can do the work of design without using the words of design. Adam: Sometimes the words can be barriers for people. We found ourselves doing the work without necessarily using the words. People understand the purpose of deepening understanding around clients and their contexts, of bringing in different perspectives and collaborating around solutions. We also adopt a learning mindset. We start not actually knowing, and then we go through a structured process to bring the right insights to bear and bring in the right people in to design a solution. We also understand that it may not work in the first go. And we’ve got that feedback loop that helps us understand how to make it better. Learn from mistakes, from failures. It’s an iterative process, not a linear one. Yes. Make sure people know that design isn’t meant to replace their own expertise. Shannah: People can be threatened by the very notion of going to the public and talking to the users. It’s new—for us, for many. But we’re the government. We should be talking to the public. Sometimes the sense of threat comes from skilled subject matter experts in policy creation who have built long careers around being experts. To have someone in a new role, in a new department, come in and say, “Now we’re going to listen what the person on the corner says, not to what you say, with your thirty years of experience”—that’s very threatening to people. It takes a lot of small steps and comfortable engagements to start to show that these two things can work together and aren’t in opposition to each other. What are some ways to keep your edge as a design thinker—to cultivate your own design mindset and build on it? Judy: Meditate to help calm the voices of organizational conflict and different interests. Engage in the community. Find a friend—someone to talk to outside your organization. Ground yourself in similar stories or in seeing how others approach challenges. Hearing other thoughts and perspectives is enormously helpful. Understand that others who want the same things may have different approaches. Shannah: I work with amazing people who care. Public servants tend to be congenial, happy, and willing to serve. Take strength from the people around you. At the core, they want the same things we do but just have different ways of going about it. Look around you for that mental break. Chris: With design—in contrast to more traditional business processes—it’s like a muscle. You need to exercise it. It’s like a sport or an art. Just because you can follow a recipe doesn’t make you a chef! You need to practice your craft. The more you do it, the better you get at doing it. Also, engaging the senses is essential for designers. The experiences we are creating are filtered through the senses. Going to concerts, looking at art, going out into nature—these provide a source of inspiration in a nonlinear way—one that isn’t directly related to projects. These experiential, sensory activities can help you plug into design projects. Peter: RBC is not just one company. It has many capabilities and functions. We can lean on many experts. They often love design. Find the roster. Go down that list. Go bother someone for an hour. We’ve built an internal community from people we met through Bridgeable and Rotman graduates. Talk to good people… Just get together with other people who are maybe a bit further along in the journey, or even a bit behind. There’s so much you can learn from each other. Find your communities of practice. Adam: In social services, we talk a lot about communities of practice. These are useful. We got into this through Bridgeable’s Designership program and having consultants help us solve some problems. Engage with the service design community. Go to conferences. Knowing other people who are trying to do this work is really useful when you’re trying to take new methods and new ideas and figure out how to use them in practice. Compare war stories, success stories. Without that, you’re on an island, and it’s harder to keep at it. To expand your experience, take your methods into a different context. Judy: I had the good fortune to be invited to coach a women’s entrepreneurship initiative over a couple of weekends. I was given the challenge of teaching design thinking to women at risk who are starting up food businesses. They were from varying demographics—ages, education levels, etc. The experience was humbling, and it made me reflect on how to take my learnings back to my work at TELUS. In this context, the words didn’t help—I couldn’t talk about design, and I wasn’t going to get anywhere talking about journey mapping. I needed to focus on the needs and concerns of the group. I asked myself: How could I convey what I know, meaningfully, without using the language or throwing up process diagrams? How do I boil down what I do, day in and day out? I learned about the audience. They really enjoyed the group work, helping each other out. It was an illuminating exercise. So, it’s not always about new methods. Sometimes it’s about taking the same methods into a new context. This can add to your experience set, your toolkit. David: My own two cents—and this has come up in what’s been said here tonight—is this: Talk to good people. Chris and I were on parallel paths very early on this journey, and we spent a lot of time exchanging some of the struggles and challenges we were facing, which was really great. And forums like this, where people have talked about communities of practice, are always helpful. Just get together with other people who are maybe a bit further along in the journey, or even a bit behind. There’s so much you can learn from each other. How do you foster the design mindset in an organization? Motivate your people to speak up, even when they think no one will listen. Peter: At RBC we have a Barbie doll named Cassandra. In Greek mythology, Cassandra was a woman who was cursed with always speaking the truth but having no one ever listen to her. We hand out Cassandra instead of saying “I told you so.” It’s a motivation tactic. It encourages people to speak up and not be afraid, even when no one will listen to you. It started as a joke, but now everyone wants to be recognized as the one who no one listened to, even when they were right. Take it to the top and get executive buy-in. Shannah: The person at the top—someone with power and clout—is key to fostering the design mindset. Without their buy-in, it’s hard to move forward. You have to have someone shouting from the mountaintop. We are lucky to be led by Ontario’s first Chief Digital Officer, Deputy Hillary Hartley. This has made design a reality in our environment. It’s formalized the design mindset in an executive role and allowed it to flourish. Weave the design mindset into your internal processes. Adam: Over the last year we’ve invested a lot of energy in asking ourselves what culture we want to have in our organization and what our values are. This led us to figure out how we could we have an explicit culture and values that are about design—making sure we are collaborative internally and with partners, with everything based on human-centred principles and a learning mindset. This came from a co-designed conversation about our culture, and it extends to hiring, training. It’s about making sure that everyone who comes into this work is thinking this way, not only because it’s how we want to be, but because anyone who doesn’t have this mindset, this perspective, will struggle to succeed in their role. Strategic planning, operational planning, HR: the design mindset is woven into these processes. Set yourself up for success by being selective about which projects you take on. Judy: Initially I felt exuberant, that everyone can do this. And I still have a lot of optimism. But you need to have some specific parameters around where you say no. We have a brief intake process. It asks things like: Do you have a budget? Do you have support from leadership? Is this a priority? There are certain markers that enable us to have confidence that a project will succeed. Otherwise you’re signing yourself and your team up to move forward with a project that might not go very far. I want to make sure my team walks into something set up to succeed. Understand how to work with people who don’t have a design mindset. Shannah: Understanding how to work with people who don’t have a design mindset is part of having a design mindset because not everyone is going to have that—and, yet, they may be core and key to your objective. So it’s incumbent upon us as designers to figure out how to work with non-designers. Remember that people are part of your design. Chris: Not everyone can be a designer, but everyone can get the logic. The people involved in the project, inside the organization, are part of the material we’re designing. It’s not just the touchpoints or a service. Think about an organization. It’s a set of norms and rules—things that are agreed to. It’s socially constructed. The best way to make change is through the project itself, but the people leading the project need to have the orientation that the people involved are part of what you’re designing. To inspire people to change how they do things, demonstrate a value proposition. Adam: People often say that design isn’t all about personas, journey maps, and so on, but we found those outputs helpful in generating interest inside and outside our organization. We did a project with City of Toronto Social Services in which we traced the experience of individuals using that service, put them into a journey map, and gave it back to them. It was the first time they’d seen the experience of a Torontonian who needs their services from beginning to end. They were excited about it. It led to new conversations. It led to an interest in the value that was being added. You need to demonstrate a value proposition in order to inspire people to change how they do things and break the mold of how they’re doing things now. Chris pointed out at the end of the session that, in contrast to the story of many established disciplines, the story of design—of its impact on society and business—is still being written. We get to be part of that. We can afford to experiment. And that’s pretty exciting.